Out of all the tabs I’ve done this one has probably been the longest time coming. I first heard Beachwalk on a copy of ‘Ukulele Breeze that I borrowed from the Kona library many years ago. This was before I really had any idea how to play ‘ukulele, before I had even heard Jake and James and Brittni, before I started this site, before I actually met Ohta, before I played this same song at my audition for the Institute of Hawaiian Music. The song itself has been in my life longer than any other tune I know how to play. And out of all the great ‘ukulele instrumentals I’ve heard, it stands strong as one of my all-time favorites. In true Herb form, Beachwalk is a simple song. It is, however, not so simple to play. To get the feel of bouncing back and forth between the chords and picking is quite a task, but once you do it will shed light on how to really master the style of solo fingerpicking arrangements. The tab is as accurate a representation of the recording as I could come up with, focusing on the lead ‘ukulele part. The chords above the staff should be helpful with adding some chords here and there to fill out the sound if you are playing it solo. 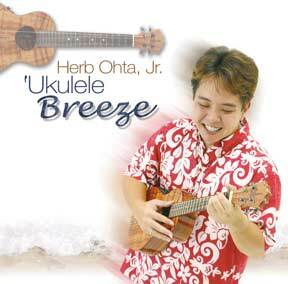 Beachwalk ‘Ukulele Tab by Herb Ohta Jr.